Shinji by Kanesaka is the eponymous Macau outfit of Tokyo’s acclaimed original restaurant in Ginza by sushi master chef Shinji Kanesaka. His culinary philosophy is steeped in tradition and reveres purity and harmony of ingredients. 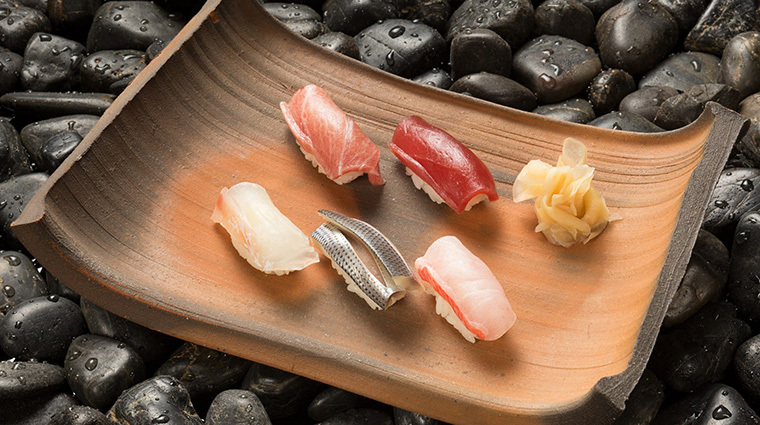 Everything from the artisanal akazu (red vinegar), rice and Japanese hot spring water is imported to create authentic sushi flavors and textures. There are set menus for lunch and dinner as well as various omakase, or “leave it up to the chef” menus, plus the option to order à la carte. 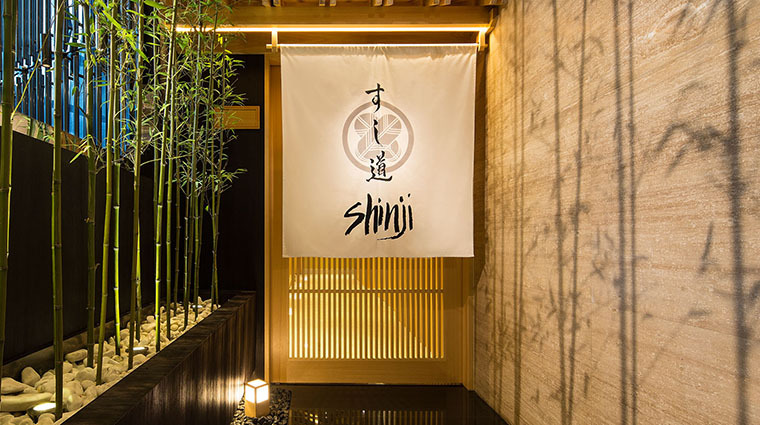 Chef Toru Osumi and senior sous chef Kenichi Fujimoto run the kitchen of Shinji by Kanesaka in Macau at Nüwa Macau within the City of Dreams complex. The restaurant is a discreet enclave with woody minimalist interiors designed by Junzo Irikado, who also designed the original Ginza restaurant. The interiors are minimalist with plenty of light wood. The main feature is the long sushi bar table made from a 220-year-old Japanese cypress tree that seats no more than 12. The sushi bar counter offers the best seats in the house to watch the theater of sushi and sashimi preparation, and of course engage with the chefs. A large colorful pop art piece featuring chef Kanesaka amid smiling flower motifs, the iconic pattern of the Cosmic Bloom collection, a personalized gift by artist Murakami Takashi, best known for his color series for Louis Vuitton. The intimate space is discreetly tucked away on the lobby floor of Nüwa Macau with a little bamboo forest entrance. The relaxing and Zen dining ambience feels a world away from the glitzy excitement of the casinos on the other end of the hotel. 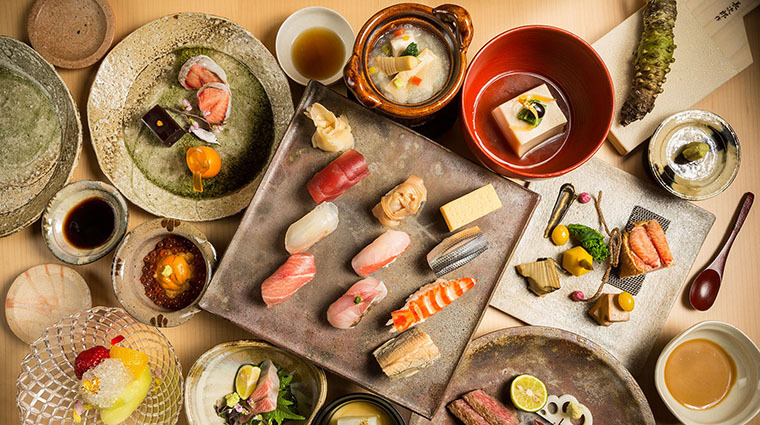 The omakase menu is the best to experience the restaurant — it involves at least 20 dishes ( the servings are small) that include a variety of sushi types. The sushi restaurant can be tricky to find. 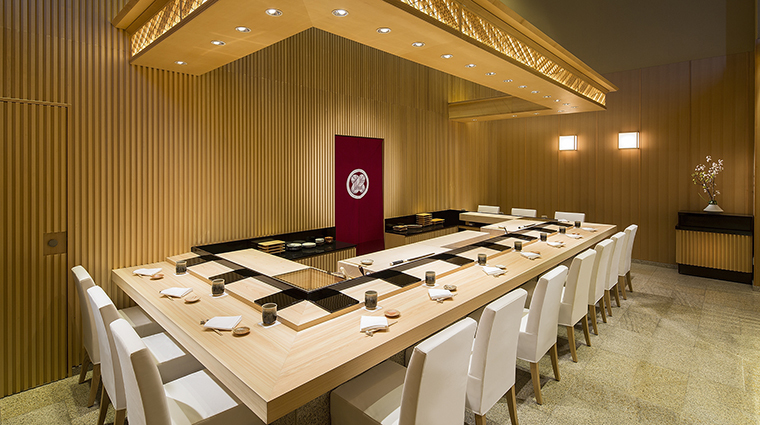 Shinji by Kanesaka is located on the far right of the lobby of Nüwa Macau, past the reception desk. While the most interactive experience takes place at the bar, if you’re a party larger than four, you’d likely be seated in the private dining rooms. Put in the request for bar seats and the restaurant is usually happy to accommodate with advanced notice. Everything served is seasonal here, so if you have any favorites, do ask the wait staff or chef, so it can be included in your omakase menu if available. All the sushi made here adheres to the traditional Edomae-style of preparation, and the omakase menu is the way to go for a full degustation. If prefer only sushi, choose the Edomae 15 menu. The “Wa” (harmony) and “Shin” (authentic and traditional) menus include sashimi and appetizers. For dinner, there are only three menus, one sushi-specific and the other two omakase. Best to have a dining partner for the opportunity to try both menus. The sake list features a wide variety including plum sake and sake cocktails. And there’s an interesting sommelier selection from champagne to handpicked old-world wines to pair with the Japanese menu. Shinji Kanesaka is a master of his trade and gained international notoriety from opening his first sushi restaurant, Sushi Kanesaka, in Tokyo. To ensure the quality of the produce that makes its way to Macau from Japan up to five times a week, chef Kanesaka carefully selects the seafood that leaves Tokyo’s Tsukiji fish market. 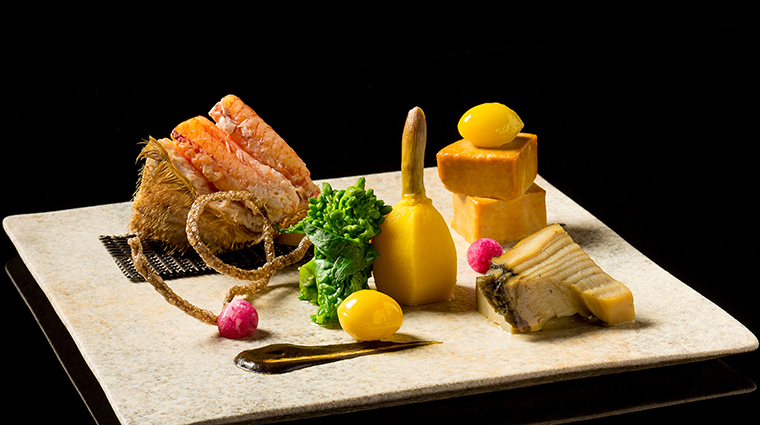 In the Macau restaurant, chef Osumi adheres strictly to traditional sushi preparation methods, but sometimes adds a luxurious twist for the glam Macau audience — topping sushi with caviar.